The Water Resources Development and Management Sub-sector. The National Water Policy was later revised in 2010. This was then followed by the second phase which was the enactment of a new Water Resources Management Act No. 21 of 2011. It replaced and repealed the Water Act of 1949 which offered a very limited approach towards water resources management. The Act came into effect by an Order of Government on the 1st of October, 2012. The inaugural Board was appointed by the Minister in March, 2013. The Board appointed its first Director General in May, 2014 who started populating the WARMA structure in 2015. The Kafue Catchment Office was the first catchment office to be established in WARMA. It was set up in January 2016 with the inaugural Catchment Manager, Mr. Rowen Jani, appointed at the same time. The first office was set up in Mazabuka in June 2016 but later relocated to Lusaka in July 2017 to give way for the establishment of the Lower Kafue Sub Catchment Office located on Plot 991, St. Edmunds Street in Mazabuka. The inaugural Sub Catchment Manager Mr Chipo Mubambe was appointed in August 2016. The Kafue Catchment also has the Upper Kafue Sub Catchment Office located in Room 82 at the Ndola Civic Centre. The Catchment Head Offices are located at Block 30, Mulungushi House, Lusaka. The total staff establishment in the Kafue Catchment currently stands 12 with 68 Gauge Readers. The Catchment has since developed the Draft Kafue Catchment Management Plan. The Luangwa Catchment Office was the second catchment to be established in WARMA. It was setup in April, 2016 with the inaugural Catchment Manager, Mr. Oscar Silembo, appointed at the same time. The Offices were first located on Plot 2005/2006, Dambo Road, Light Industrial Area in Kabwe. The Head Office for Luangwa Catchment is still at this same location. In 2017, the Luangwa Catchment Office established another Sub-Office in Mkushi. The total staff establishment in the Luangwa Catchment currently stands at ten (10). The Chambeshi Catchment was the third Catchment Office to be established in WARMA. It was setup in May, 2016 with the inaugural Catchment Manager, Mr. Mwiza Muzumara, appointed at the same time. The Catchment Office was first located at Plot 38, Mukulumpe Road, Central Town. The Offices are still at this same location. Operationally, the Chambeshi Catchment oversees the Tanganyika and Luapula Catchments whose Offices are not yet established. The current staff establishment in the Chambeshi Catchment stands at nine (9). The Zambezi Catchment was the fourth catchment office to be established in WARMA. It was setup in April, 2017 with the inaugural Catchment Manager, Mr. Happiness Malawo, appointed at the same time. The Catchment Office was first located at the junction of Airport Road/Chitimukulu Road (Adjacent to APG Milling Company) and has maintained this location to date. The current staff establishment in the Zambezi Catchment is seven (7). WARMA plans to open and operationalize the Tanganyika and Luapula catchment offices in 2019. Operations in these Catchments are currently being overseen by the Chambeshi Catchment Office. SI No. 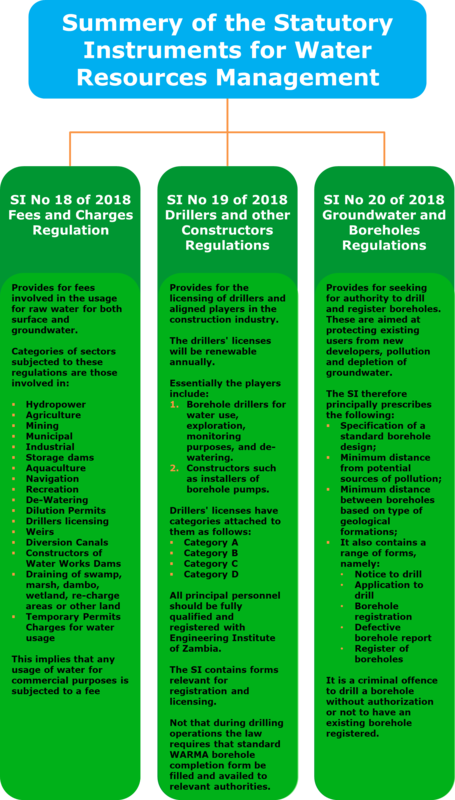 20 Groundwater and Boreholes Regulations. The regulations were developed together with multiple stakeholders, including Drillers, Commercial Farmers, the general public and various other interest groups. The stakeholders not only advised on the formulation of these regulations but although on a sustainable pricing strategy that will ensure further economic growth. In a nutshell, the newly introduced SIs bring in inclusiveness in the management of Water resources by not only trying to safeguard surface water but groundwater as well by banning the drilling of boreholes without authority. It entails submission of applications prior to drilling as well as registration of all existing boreholes and should the water be utilised for non-domestic purposes the usage will attract fees. The SIs further provide prescribed for specifications for a standard borehole design and distances for siting boreholes from potential sources of pollution such as pit latrines soakaways, garage, fuel tanks, cemeteries etc. Prescribed distances are also listed for minimum distances between boreholes with respect water quantity as dictated by the hydrogeological conditions. In here the benefits include the fact that clients will be protected from substandard jobs and services from unknown contractors and personnel. Enough information will also be collected and borehole owners consulted before further drilling can take place to assess impacts in the area. The regulations for groundwater and boreholes are also aimed to regulate groundwater de-watering that is normally associated with mining operations. This implies that mining firms need to obtain licences for conducting dewatering.